Spring Fling Seasonal Skinnies! 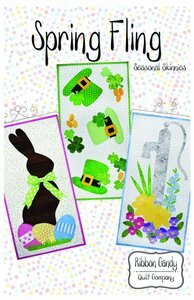 Enjoy Springtime with these 3 fusible applique quilts. Each quilt finishes 14" x 28" and is perfect for any room in your home. Super fast and easy to make, you will be getting these done in no time at all. The templates are all full size and ready to be used. You can't just make one. These are perfect for gifts too!